As The Chelsea Flower Show approaches on May 22, London is bursting into bloom. Diners and drinkers are spilling out onto the streets to enjoy the great British heatwave. We find 10 of the best restaurants with dreamy terraces, gorgeous gardens and cosy courtyards for al fresco dining. This Italian restaurant prides itself on using only the finest, freshest ingredients, and the reviews back this up. There is an attractive outside dining area, which always proves popular with locals. Signature dishes include veal Milanese and saffron risotto, but the tiramisu is what gets the diners sighing. 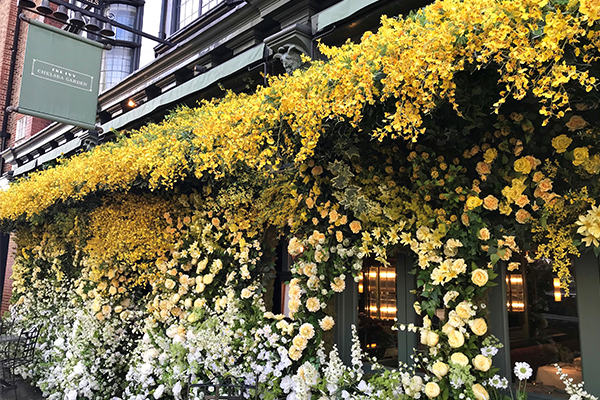 Belgravia in Bloom will open with a floral flourish on May 19, echoing the theme of the V&A exhibition featuring Frida Khalo, the iconic Mexican artist. 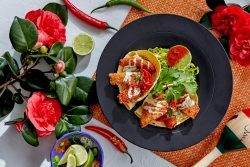 The Terrace will also go Mexican, with cocktails and Mexican food, as well as a distinctly Mexican feel to the décor and colourful flowers. If you spend more than £30 per person and quote Frida Khalo, you will get a ticket to the exhibition at the V&A. Motcombs is a national treasure in Belgravia. Famous for its delicious food and extensive wine list, this is a favourite with local business people, as well as residents and visitors to the area. You immediately feel at home on the Motcomb Street. Once you discover, La Poule Au Pot, it is hard to resist. This classic French restaurant is full of atmosphere. The white linen tablecloths contrast with the greenery and the rustic tables and chairs, making this a magnificently romantic summer venue. High above Knightsbridge and Belgravia, Harvey Nichols’s Fifth floor café awaits. This stylish, covered café and bar serves food all day, and drinks, too. The perfect place to relax and catch up with friends after shopping for some of the most stylish clothes in London. The Alfred Tennyson could not be better located for al fresco dining. It is situated in the heart of Belgravia on Motcomb Street, minutes from the glorious gardens of Belgrave Square. The first-floor restaurant and ground-floor bars are complemented by a bustling atmosphere in the outdoor seating area. There is an impressive wine list with more than 32 wines by the glass, as well as a large selection of beers and cocktails. It is an ideal setting for summer dining. What makes the perfect al fresco restaurant for summer? Plenty of outdoor seating? Friendly staff and a delicious menu? Percy and Founders in Fitzrovia, ticks all the boxes. 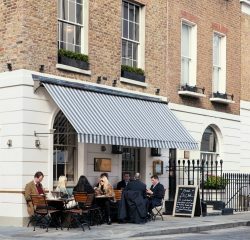 This British-European restaurant has a sophisticated interior and a spacious terrace, which is great for a lunchtime snack, or relaxing after work. It’s a destination restaurant with a bar, lounge and a cool west London vibe. Jazz goes to Scotland at this buzzing live music bar and restaurant. The tartan chairs and vast whisky selection might have you believe you are in the Highlands, but the enticing terrace is minutes from central London. 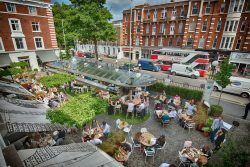 The sun-soaked garden on King’s Road is one of Chelsea’s best-loved hot spots. There are giant planters with mature trees and shrubbery. Leafy latticework and antique mirrors, and velvet-covered seating create a restful, rustic atmosphere. The extensive menu is full of tempting choices for brunch, breakfast or all-day a la carte, from 8 until late. The Courtyard at the Bluebird, Chelsea, is a green oasis on the Kings Road. With grass and cobbles, it enhances the Art Deco café, which itself is flooded with light and dotted with mature trees. The Spring all-day dining menu included such delights as asparagus salad and salt marsh lamb chops. Or you can drop in for breakfast brunch, or just a cocktail after The Chelsea Flower Show. Contact Henry & James for a free property valuation on Tel 020 7235 8861 or email belgraviaoffice@henryandjames.co.uk.